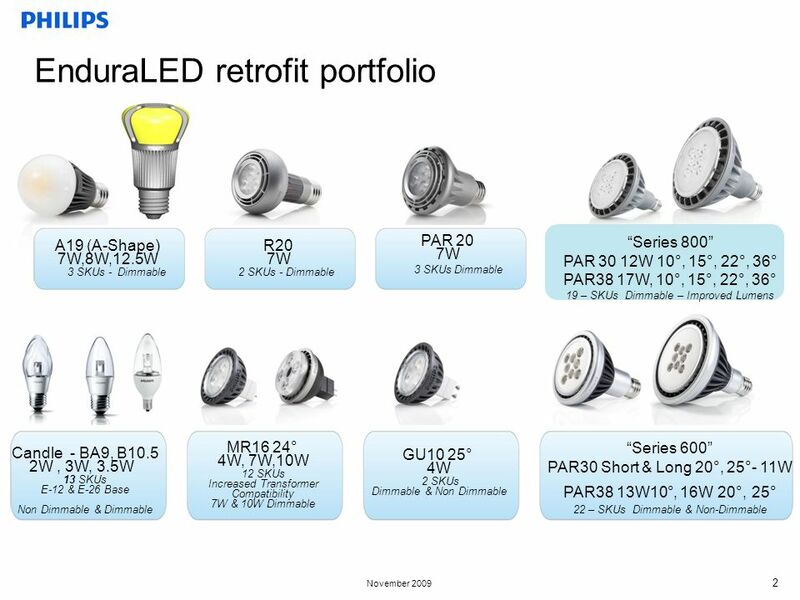 Philips EnduraLED Retrofit LED Lamps Portfolio as of April 2011. 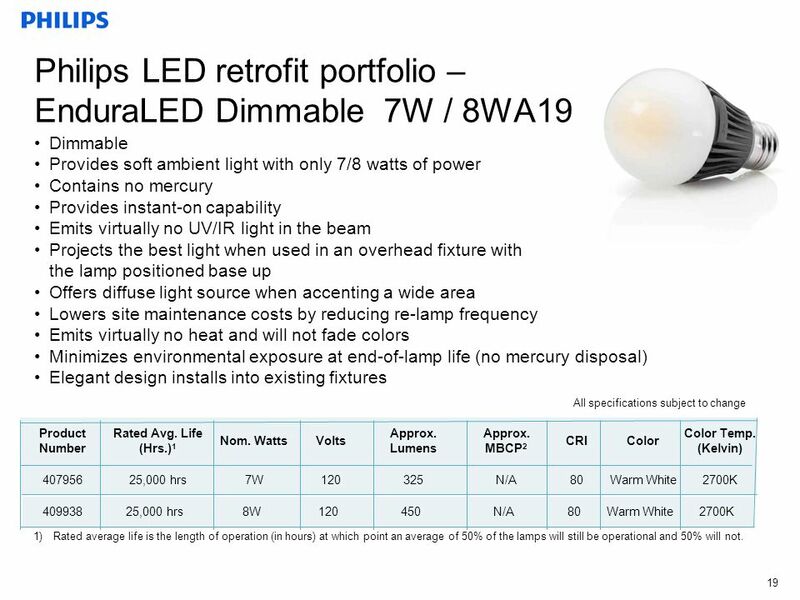 4 May 2010 4 Dimmable Instant on light Emits virtually no UV/IR light in the beam Lasts 25,000 hours rated average life 1,2 Delivers quality white light and a perfect beam quality 7WSaves 28 watts of energy when compared to a 35W halogen MR16 3 Color temperature spread ±145K Contains no mercury Will not fade colors, avoids inventory spoilage 3-year warranty period All specifications subject to change Product Number Rated Avg. Life (Hrs.) 1,2,4 Nom. Watts DimmableVolts Approx. Lumens 5 Approx. MBCP 5,6 Beam Angle CRIColor Color Temp. (Kelvin) 41003525,0007WDimming12370160024°83 Warm White 3000 NEW Philips LED retrofit portfolio – EnduraLED Dimmable7W MR16 (24°) 1)Rated average life is the length of operation (in hours) at which point an average of 50% of the lamps will still be operational and 50% will not. 2)Rated average life based on engineering testing and probability analysis. 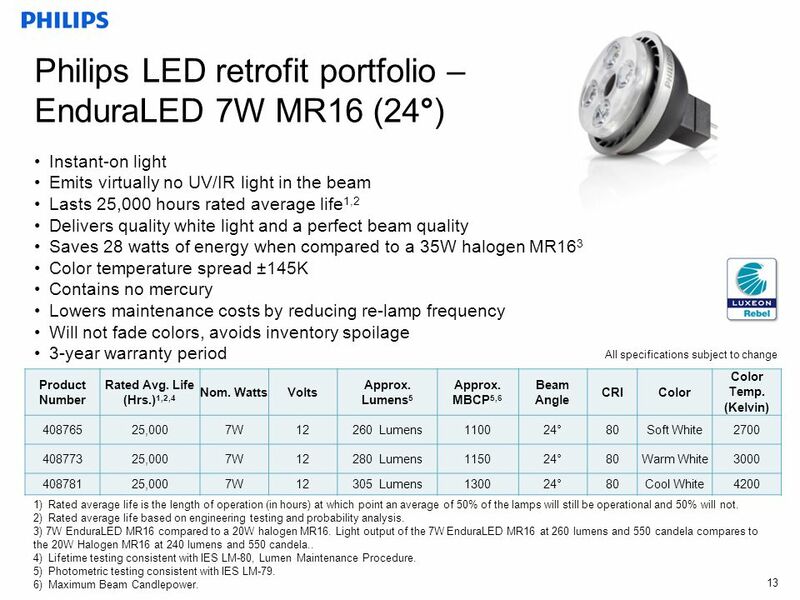 3) 7W EnduraLED MR16 compared to a 35W halogen MR16. 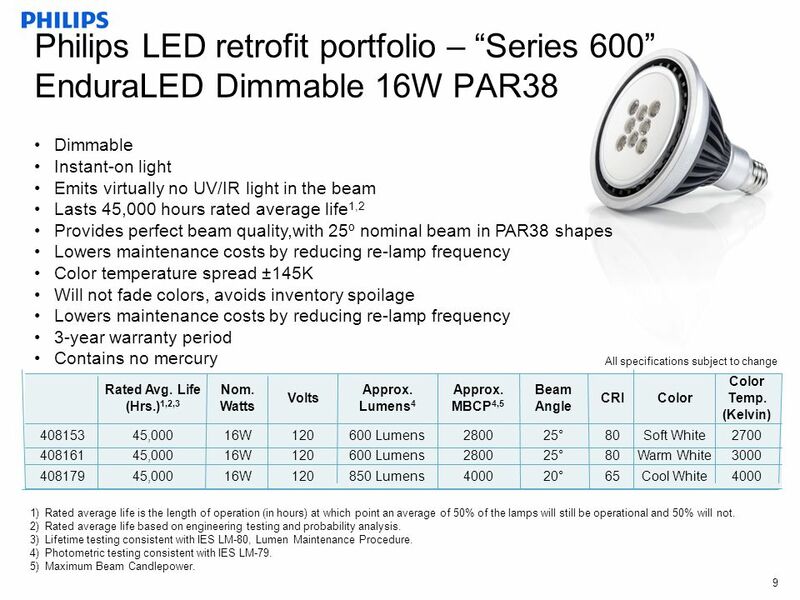 Light output of the 7W EnduraLED MR16 at 260 lumens and 550 candela compares to the 35W Halogen MR16 at 240 lumens and 550 candela.. 4)Lifetime testing consistent with IES LM-80, Lumen Maintenance Procedure. 5)Photometric testing consistent with IES LM-79. 6)Maximum Beam Candlepower. 5 May 2010 5 Dimmable Instant-on light Emits virtually no UV/IR light in the beam Lasts 45,000 hours rated average life 1,2 Provides perfect beam quality,with 22º nominal beam in PAR38 shapes Lowers maintenance costs by reducing re-lamp frequency Color temperature spread ±145K Will not fade colors, avoids inventory spoilage Lowers maintenance costs by reducing re-lamp frequency 3-year warranty period Contains no mercury All specifications subject to change Part # Rated Avg. Life (Hrs.) 1,2,3 Nom. Watts Volts Approx. Lumens 4 Approx. MBCP 4,5 Beam Angle CRIColor Color Temp. (Kelvin) 41017545,00017W120880 Lumens350022°85Soft White2700 41018345,00017W120930 Lumens370022°85Warm White3000 41019145,00017W1201050 Lumens430022°75Cool White4200 EnduraLED Dimmable 17W PAR38 Series 800 - Improved Lumens 1)Rated average life is the length of operation (in hours) at which point an average of 50% of the lamps will still be operational and 50% will not. 2)Rated average life based on engineering testing and probability analysis. 3)Lifetime testing consistent with IES LM-80, Lumen Maintenance Procedure. 4)Photometric testing consistent with IES LM-79. 5)Maximum Beam Candlepower. 6 May 2010 6 Dimmable Instant-on light Emits virtually no UV/IR light in the beam Lasts 45,000 hours rated average life 1,2 Provides perfect beam quality,with 22º nominal beam in PAR30 shapes Lowers maintenance costs by reducing re-lamp frequency Color temperature spread ±145K Will not fade colors, avoids inventory spoilage Lowers maintenance costs by reducing re-lamp frequency 3-year warranty period Contains no mercury All specifications subject to change Part # Rated Avg. Life (Hrs.) 1,2,3 Nom. Watts Volts Approx. Lumens 4 Approx. MBCP 4,5 Beam Angle CRIColor Color Temp. (Kelvin) 41011845,00012W120660 Lumens290022°85Soft White2700 41012645,00012W120700 Lumens310022°85Warm White3000 41013445,00012W120800 Lumens360022°75Cool White4200 EnduraLED Dimmable 12W PAR30S Series 800 – Improved Lumens 1)Rated average life is the length of operation (in hours) at which point an average of 50% of the lamps will still be operational and 50% will not. 2)Rated average life based on engineering testing and probability analysis. 3)Lifetime testing consistent with IES LM-80, Lumen Maintenance Procedure. 4)Photometric testing consistent with IES LM-79. 5)Maximum Beam Candlepower. 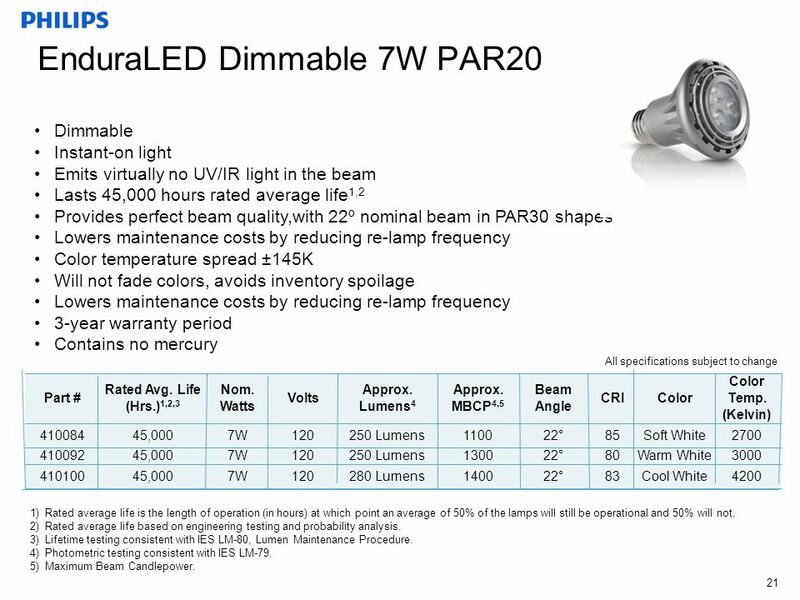 7 May 2010 7 Dimmable Instant-on light Emits virtually no UV/IR light in the beam Lasts 45,000 hours rated average life 1,2 Provides perfect beam quality,with 22º nominal beam in PAR30 shapes Lowers maintenance costs by reducing re-lamp frequency Color temperature spread ±145K Will not fade colors, avoids inventory spoilage Lowers maintenance costs by reducing re-lamp frequency 3-year warranty period Contains no mercury All specifications subject to change Part # Rated Avg. Life (Hrs.) 1,2,3 Nom. Watts Volts Approx. Lumens 4 Approx. MBCP 4,5 Beam Angle CRIColor Color Temp. (Kelvin) 41014245,00012W120660 Lumens290022°85Soft White2700 41015945,00012W120700 Lumens310022°85Warm White3000 41016745,00012W120800 Lumens360022°75Cool White4200 EnduraLED Dimmable 12W PAR30L Series 800 – Improved Lumens 1)Rated average life is the length of operation (in hours) at which point an average of 50% of the lamps will still be operational and 50% will not. 2)Rated average life based on engineering testing and probability analysis. 3)Lifetime testing consistent with IES LM-80, Lumen Maintenance Procedure. 4)Photometric testing consistent with IES LM-79. 5)Maximum Beam Candlepower. 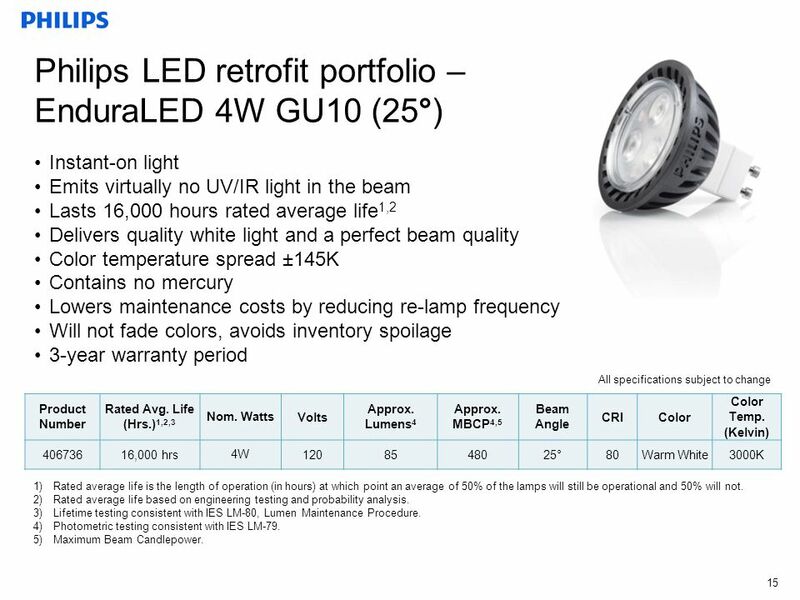 8 May 2010 8 Non-Dimmable Instant-on light Emits virtually no UV/IR light in the beam Lasts 45,000 hours rated average life 1,2 Provides perfect beam quality,with 25º nominal beam in PAR38 shapes Lowers maintenance costs by reducing re-lamp frequency Color temperature spread ±145K Will not fade colors, avoids inventory spoilage Lowers maintenance costs by reducing re-lamp frequency 3-year warranty period Contains no mercury All specifications subject to change Rated Avg. Life (Hrs.) 1,2,3 Nom. Watts Volts Approx. Lumens 4 Approx. MBCP 4,5 Beam Angle CRIColor Color Temp. (Kelvin) 40698245,00016W120600 Lumens280025°80Soft White2700 40680145,00016W120600 Lumens280025°80Warm White3000 40679345,00016W120850 Lumens400020°65Cool White4200 40793245,00013W120600 Lumens169010°80Warm White3000 Philips LED retrofit portfolio – Series 600 EnduraLED 16W, 13W PAR38 (non-dimming) 1)Rated average life is the length of operation (in hours) at which point an average of 50% of the lamps will still be operational and 50% will not. 2)Rated average life based on engineering testing and probability analysis. 3)Lifetime testing consistent with IES LM-80, Lumen Maintenance Procedure. 4)Photometric testing consistent with IES LM-79. 5)Maximum Beam Candlepower. 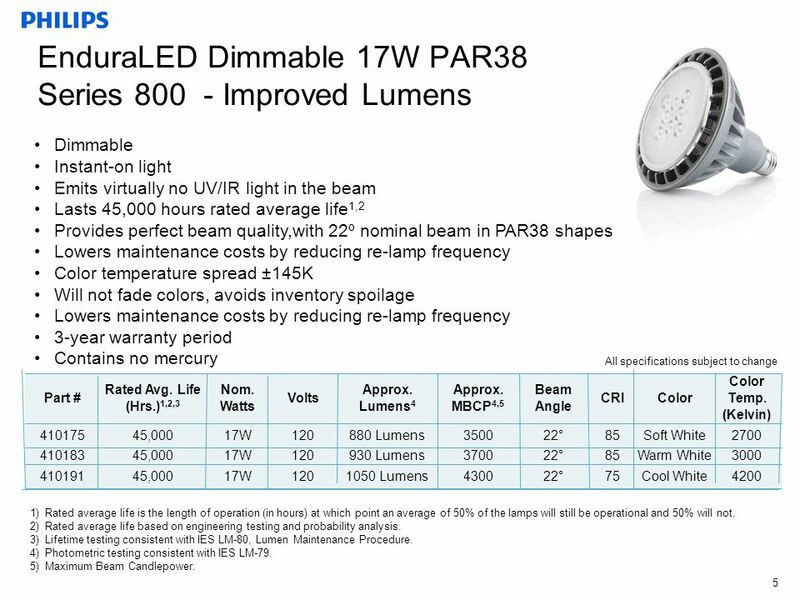 9 May 2010 9 Dimmable Instant-on light Emits virtually no UV/IR light in the beam Lasts 45,000 hours rated average life 1,2 Provides perfect beam quality,with 25º nominal beam in PAR38 shapes Lowers maintenance costs by reducing re-lamp frequency Color temperature spread ±145K Will not fade colors, avoids inventory spoilage Lowers maintenance costs by reducing re-lamp frequency 3-year warranty period Contains no mercury All specifications subject to change Rated Avg. Life (Hrs.) 1,2,3 Nom. Watts Volts Approx. Lumens 4 Approx. MBCP 4,5 Beam Angle CRIColor Color Temp. (Kelvin) 40815345,00016W120600 Lumens280025°80Soft White2700 40816145,00016W120600 Lumens280025°80Warm White3000 40817945,00016W120850 Lumens400020°65Cool White4000 Philips LED retrofit portfolio – Series 600 EnduraLED Dimmable 16W PAR38 1)Rated average life is the length of operation (in hours) at which point an average of 50% of the lamps will still be operational and 50% will not. 2)Rated average life based on engineering testing and probability analysis. 3)Lifetime testing consistent with IES LM-80, Lumen Maintenance Procedure. 4)Photometric testing consistent with IES LM-79. 5)Maximum Beam Candlepower. 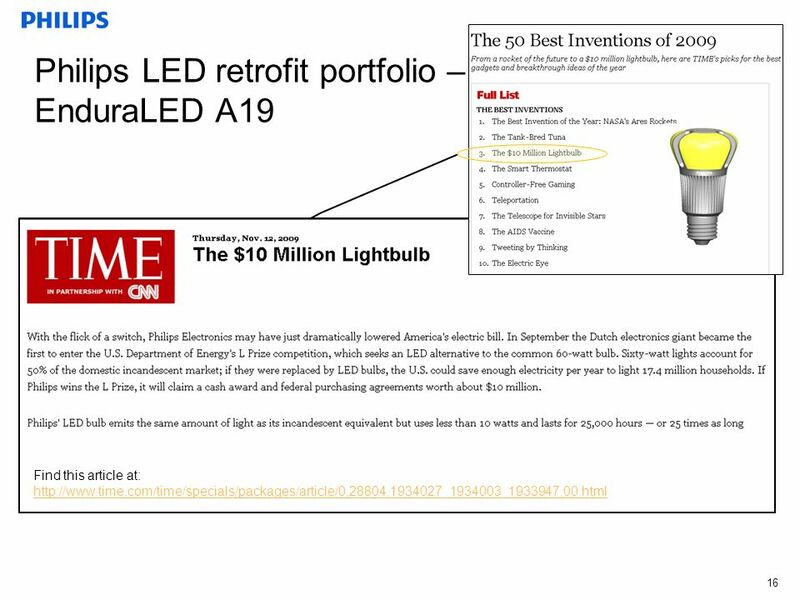 10 May 2010 10 Instant-on light Emits virtually no UV/IR light in the beam Lasts 45,000 hours rated average life 1,2 Provides perfect beam quality with 25º nominal beam in PAR30L & PAR30S shapes Saves 39 watts of energy when compared to a 50W halogen PAR30 3 Will not fade colors, avoids inventory spoilage Lowers maintenance costs by reducing re-lamp frequency Color temperature spread ±145K 3-year warranty period Contains no mercury All specifications subject to change Rated Avg. Life (Hrs.) 1,2,4 Nom. Watts Volts Approx. Lumens 5 Approx. MBCP 5,6 Beam Angle CRIColor Color Temp. (Kelvin) 406769 (S) 406974 (L) 45,00011W120400 Lumens180025°85Soft White2700 406777(S) 406827 (L) 45,00011W120410 Lumens185025°85Warm White3000 406785 (S) 406819 (L) 45,00011W120560 Lumens250020°65Cool White4200 Philips LED retrofit portfolio – Series 600 EnduraLED 11W PAR30S & L (non dimming) 1)Rated average life is the length of operation (in hours) at which point an average of 50% of the lamps will still be operational and 50% will not. 2)Rated average life based on engineering testing and probability analysis. 3)11W EnduraLED PAR30 compared to a 50W halogen PAR30. Light output of the 11W PAR30S at 410 lumens and 1800 candela compares to the 50W Halogen PAR30S at 610 lumens and 1800 candela. 4)Lifetime testing consistent with IES LM-80, Lumen Maintenance Procedure. 5)Photometric testing consistent with IES LM-79. 6)Maximum Beam Candlepower. 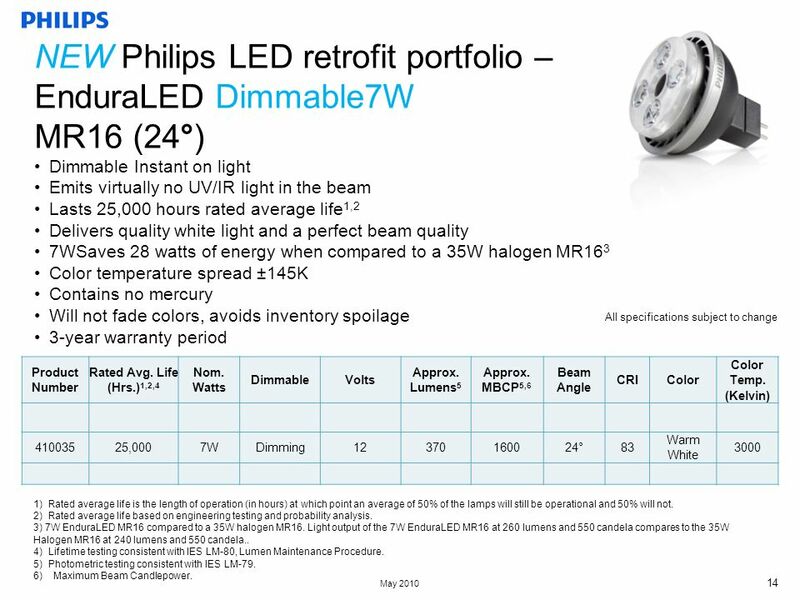 11 May 2010 11 Dimmable Instant-on light Emits virtually no UV/IR light in the beam Lasts 45,000 hours rated average life 1,2 Provides perfect beam quality with 25º nominal beam in PAR30L & PAR30S shapes Saves 39 watts of energy when compared to a 50W halogen PAR30 3 Will not fade colors, avoids inventory spoilage Lowers maintenance costs by reducing re-lamp frequency Color temperature spread ±145K 3-year warranty period Contains no mercury All specifications subject to change Rated Avg. Life (Hrs.) 1,2,4 Nom. Watts Volts Approx. Lumens 5 Approx. MBCP 5,6 Beam Angle CRIColor Color Temp. (Kelvin) 408096(S) 408120 (L) 45,00011W120400 Lumens180025°85Soft White2700 408104 (S) 408138 (L) 45,00011W120410 Lumens185025°85Warm White3000 408112(S) 408146(L) 45,00011W120560 Lumens250020°65Cool White4000 Philips LED retrofit portfolio – Series 600 EnduraLED 11W PAR30S & L Dimmable 1)Rated average life is the length of operation (in hours) at which point an average of 50% of the lamps will still be operational and 50% will not. 2)Rated average life based on engineering testing and probability analysis. 3)11W EnduraLED PAR30 compared to a 50W halogen PAR30. Light output of the 11W PAR30S at 410 lumens and 1800 candela compares to the 50W Halogen PAR30S at 610 lumens and 1800 candela. 4)Lifetime testing consistent with IES LM-80, Lumen Maintenance Procedure. 5)Photometric testing consistent with IES LM-79. 6)Maximum Beam Candlepower. 12 May 2010 12 Instant-on light Emits virtually no UV/IR light in the beam Lasts 45,000 hours rated average life 1,2 Delivers quality white light and a perfect beam quality Saves 16 watts of energy when compared to a 20W halogen MR16 3 Color temperature spread ±145K Contains no mercury Lowers maintenance costs by reducing re-lamp frequency Will not fade colors, avoids inventory spoilage 3-year warranty period All specifications subject to change Product Number Rated Avg. Life (Hrs.) 1,2,4 Nom. WattsVolts Approx. Lumens 5 Approx. MBCP 5,6 Beam Angle CRIColor Color Temp. (Kelvin) 40875745,0004W12130 Lumens55025°85Soft White2700 40827845,0004W12130 Lumens55025°80Warm White3000 40828645,0004W12180 Lumens70025°70Cool White4200 Philips LED retrofit portfolio – EnduraLED 4W MR16 (25°) 1)Rated average life is the length of operation (in hours) at which point an average of 50% of the lamps will still be operational and 50% will not. 2)Rated average life based on engineering testing and probability analysis. 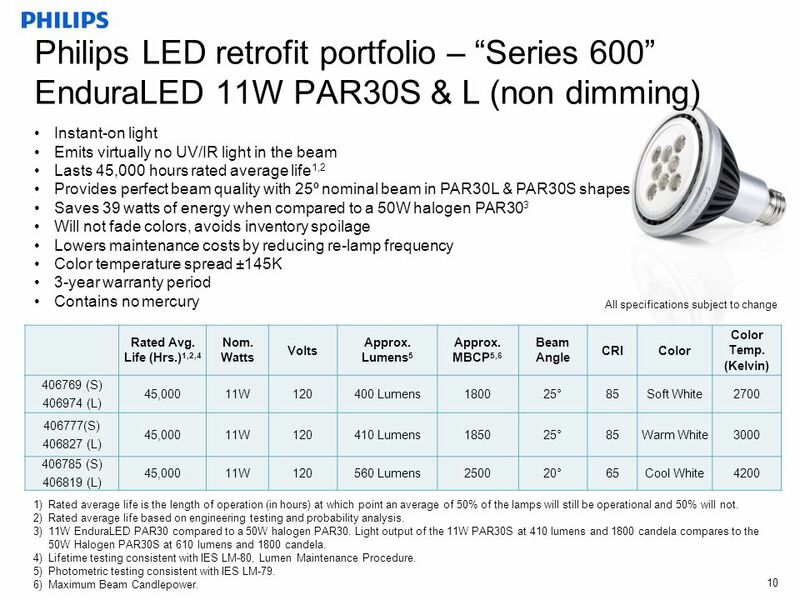 3) 4W EnduraLED MR16 compared to a 20W halogen MR16. 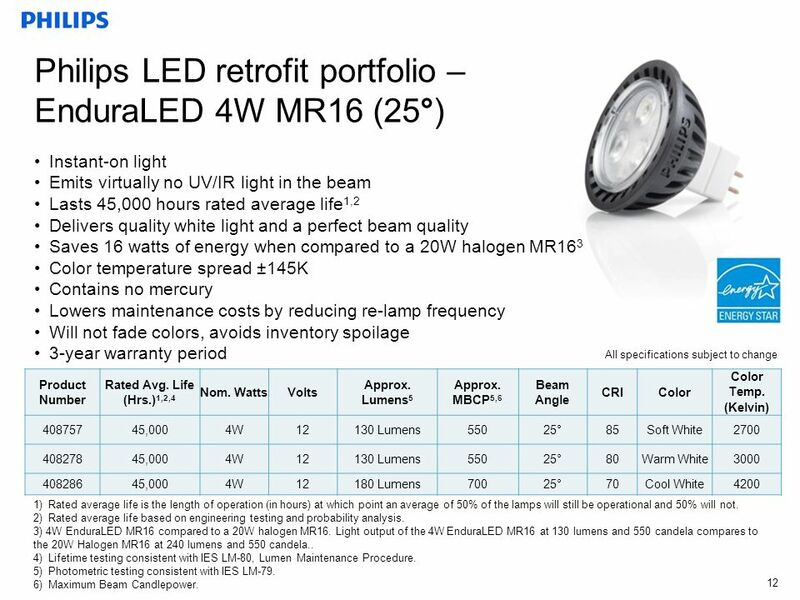 Light output of the 4W EnduraLED MR16 at 130 lumens and 550 candela compares to the 20W Halogen MR16 at 240 lumens and 550 candela.. 4)Lifetime testing consistent with IES LM-80, Lumen Maintenance Procedure. 5)Photometric testing consistent with IES LM-79. 6)Maximum Beam Candlepower. 13 May 2010 13 Instant-on light Emits virtually no UV/IR light in the beam Lasts 25,000 hours rated average life 1,2 Delivers quality white light and a perfect beam quality Saves 28 watts of energy when compared to a 35W halogen MR16 3 Color temperature spread ±145K Contains no mercury Lowers maintenance costs by reducing re-lamp frequency Will not fade colors, avoids inventory spoilage 3-year warranty period All specifications subject to change Product Number Rated Avg. Life (Hrs.) 1,2,4 Nom. WattsVolts Approx. Lumens 5 Approx. MBCP 5,6 Beam Angle CRIColor Color Temp. (Kelvin) 40876525,0007W12260 Lumens110024°80Soft White2700 40877325,0007W12280 Lumens115024°80Warm White3000 40878125,0007W12305 Lumens130024°80Cool White4200 Philips LED retrofit portfolio – EnduraLED 7W MR16 (24°) 1)Rated average life is the length of operation (in hours) at which point an average of 50% of the lamps will still be operational and 50% will not. 2)Rated average life based on engineering testing and probability analysis. 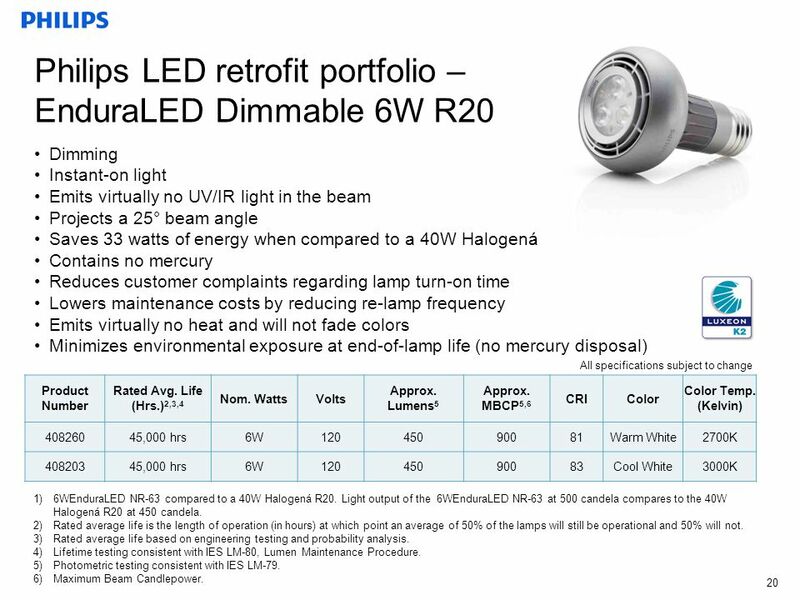 3) 7W EnduraLED MR16 compared to a 20W halogen MR16. 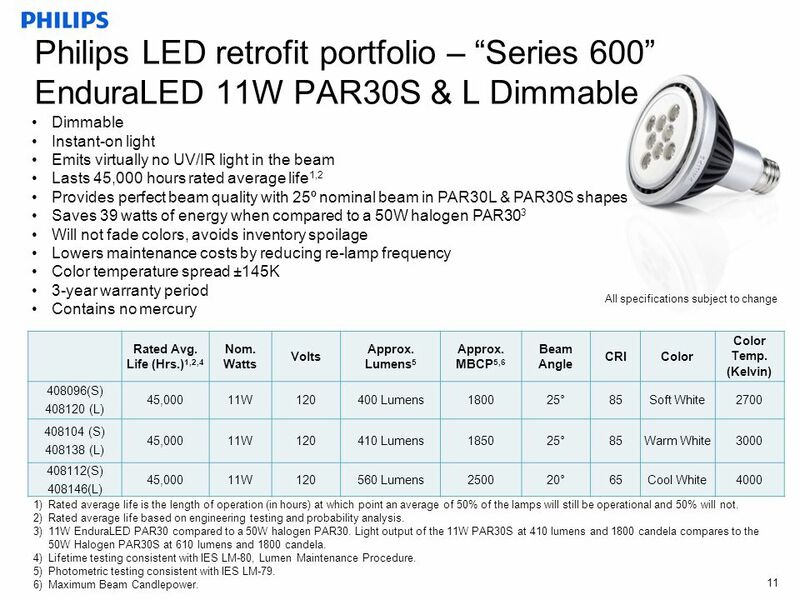 Light output of the 7W EnduraLED MR16 at 260 lumens and 550 candela compares to the 20W Halogen MR16 at 240 lumens and 550 candela.. 4)Lifetime testing consistent with IES LM-80, Lumen Maintenance Procedure. 5)Photometric testing consistent with IES LM-79. 6)Maximum Beam Candlepower. 14 May 2010 14 Dimmable Instant on light Emits virtually no UV/IR light in the beam Lasts 25,000 hours rated average life 1,2 Delivers quality white light and a perfect beam quality 7WSaves 28 watts of energy when compared to a 35W halogen MR16 3 Color temperature spread ±145K Contains no mercury Will not fade colors, avoids inventory spoilage 3-year warranty period All specifications subject to change Product Number Rated Avg. Life (Hrs.) 1,2,4 Nom. Watts DimmableVolts Approx. Lumens 5 Approx. MBCP 5,6 Beam Angle CRIColor Color Temp. (Kelvin) 41003525,0007WDimming12370160024°83 Warm White 3000 NEW Philips LED retrofit portfolio – EnduraLED Dimmable7W MR16 (24°) 1)Rated average life is the length of operation (in hours) at which point an average of 50% of the lamps will still be operational and 50% will not. 2)Rated average life based on engineering testing and probability analysis. 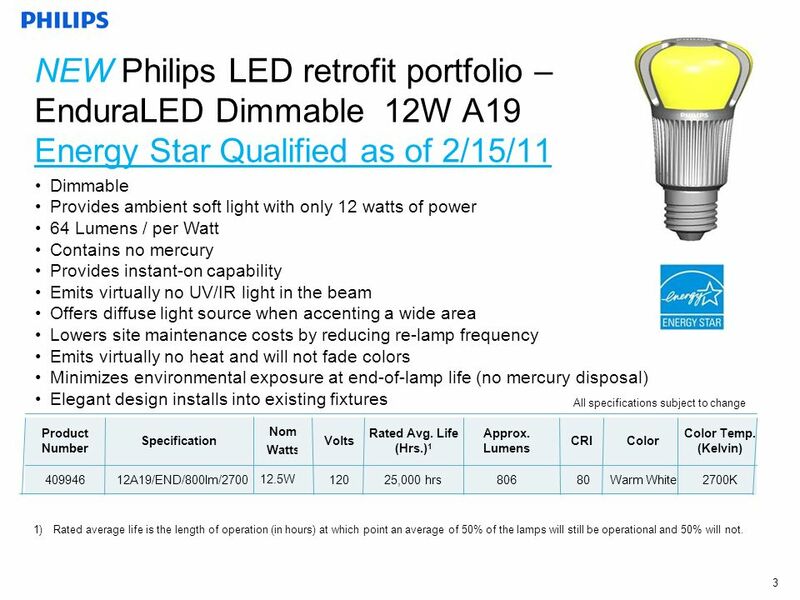 3) 7W EnduraLED MR16 compared to a 35W halogen MR16. 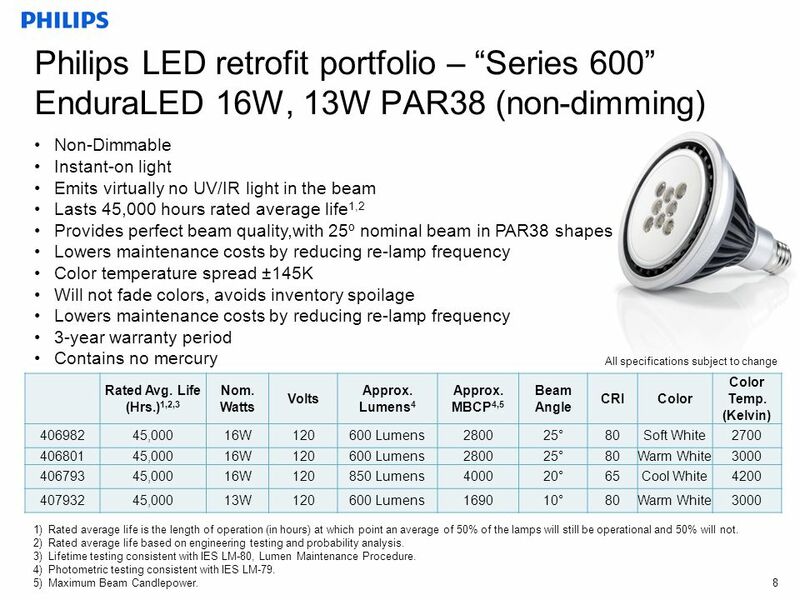 Light output of the 7W EnduraLED MR16 at 260 lumens and 550 candela compares to the 35W Halogen MR16 at 240 lumens and 550 candela.. 4)Lifetime testing consistent with IES LM-80, Lumen Maintenance Procedure. 5)Photometric testing consistent with IES LM-79. 6)Maximum Beam Candlepower. 20 May 2010 20 Dimming Instant-on light Emits virtually no UV/IR light in the beam Projects a 25° beam angle Saves 33 watts of energy when compared to a 40W Halogená® R20 1 Contains no mercury Reduces customer complaints regarding lamp turn-on time Lowers maintenance costs by reducing re-lamp frequency Emits virtually no heat and will not fade colors Minimizes environmental exposure at end-of-lamp life (no mercury disposal) All specifications subject to change Product Number Rated Avg. Life (Hrs.) 2,3,4 Nom. WattsVolts Approx. Lumens 5 Approx. MBCP 5,6 CRIColor Color Temp. 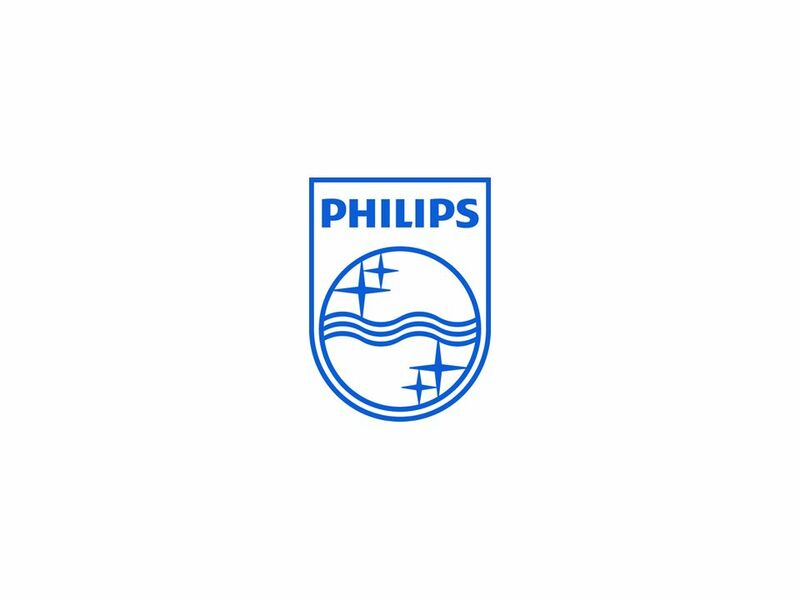 (Kelvin) 40826045,000 hrs6W12045090081Warm White2700K 40820345,000 hrs6W12045090083Cool White3000K Philips LED retrofit portfolio – EnduraLED Dimmable 6W R20 1)6WEnduraLED NR-63 compared to a 40W Halogená R20. Light output of the 6WEnduraLED NR-63 at 500 candela compares to the 40W Halogená R20 at 450 candela. 2)Rated average life is the length of operation (in hours) at which point an average of 50% of the lamps will still be operational and 50% will not. 3)Rated average life based on engineering testing and probability analysis. 4)Lifetime testing consistent with IES LM-80, Lumen Maintenance Procedure. 5)Photometric testing consistent with IES LM-79. 6)Maximum Beam Candlepower. 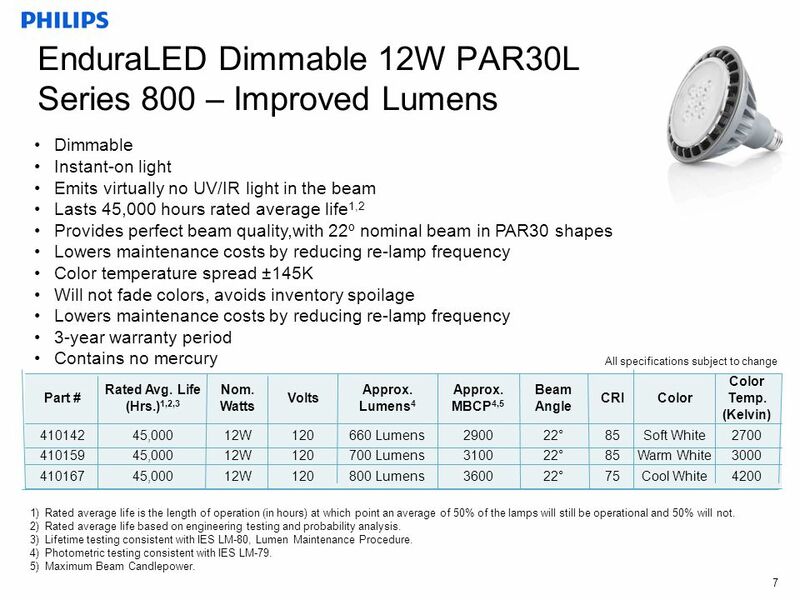 21 May 2010 21 Dimmable Instant-on light Emits virtually no UV/IR light in the beam Lasts 45,000 hours rated average life 1,2 Provides perfect beam quality,with 22º nominal beam in PAR30 shapes Lowers maintenance costs by reducing re-lamp frequency Color temperature spread ±145K Will not fade colors, avoids inventory spoilage Lowers maintenance costs by reducing re-lamp frequency 3-year warranty period Contains no mercury All specifications subject to change Part # Rated Avg. Life (Hrs.) 1,2,3 Nom. Watts Volts Approx. Lumens 4 Approx. MBCP 4,5 Beam Angle CRIColor Color Temp. (Kelvin) 41008445,0007W120250 Lumens110022°85Soft White2700 41009245,0007W120250 Lumens130022°80Warm White3000 41010045,0007W120280 Lumens140022°83Cool White4200 EnduraLED Dimmable 7W PAR20 1)Rated average life is the length of operation (in hours) at which point an average of 50% of the lamps will still be operational and 50% will not. 2)Rated average life based on engineering testing and probability analysis. 3)Lifetime testing consistent with IES LM-80, Lumen Maintenance Procedure. 4)Photometric testing consistent with IES LM-79. 5)Maximum Beam Candlepower. 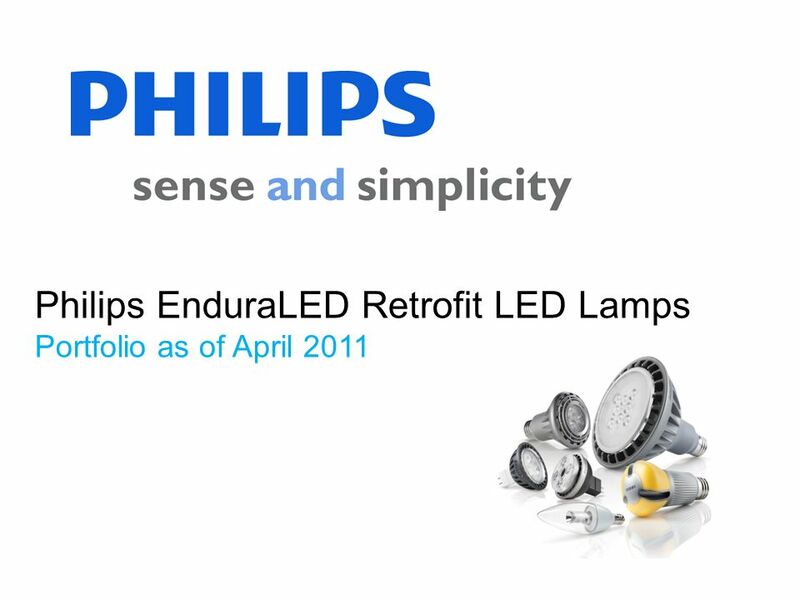 Download ppt "Philips EnduraLED Retrofit LED Lamps Portfolio as of April 2011." 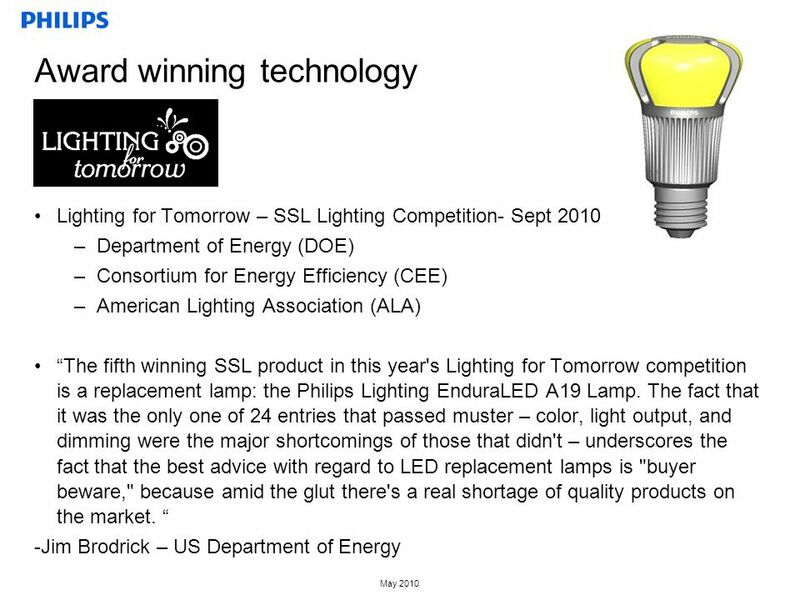 < C ² Carbon Reduction Technology Ltd A Revolution in Lighting - The e-lamp.